Many people don’t think cats are as affected by fireworks as dogs. But that’s because dogs tend to come to their owners for protection, whereas cats are more likely to hide – making their distress less visible. As you get ready to celebrate any holiday where fireworks are common (like the 4th of July or New Year’s Eve), remember that your cat has sensitive hearing. So, when explosions are happening in the sky, it probably seems like the world is ending to them. So, make sure your cat has a good hiding place, and that you do your best to keep your home as calm and quiet as possible. Animal shelters around the US report that more pets go missing around the July 4th than most any other time of the year. One of the big reasons why is that the fireworks going off scare cats, and they panic and bolt out the door or window. So, not only will keeping the house shut up tight keep some of the sounds muffled, but they’ll also help prevent your cat from making a break for it. When scared, a cat’s first instinct is usually to hide. So, help them out by setting up a quiet and comfortable area in your home. Provide a bed, litter box, water, and make sure it’s a place they’re usually comfortable in. 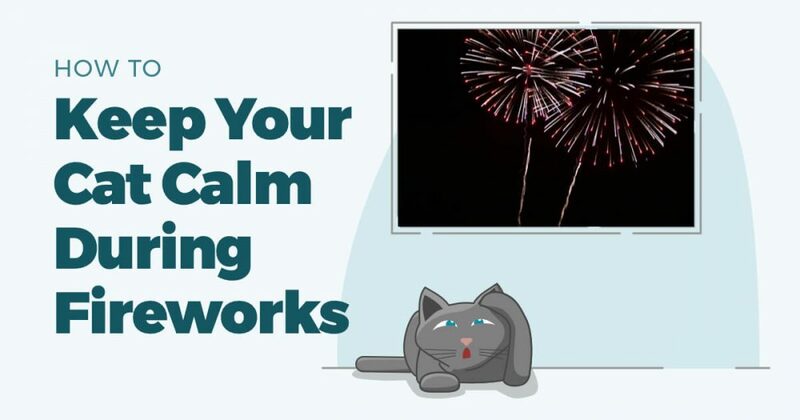 The booming of fireworks can be jarring for any of us, but particularly for cats. By playing sounds (at a moderate volume) to distract them, you can help alleviate some of the stress. For example, if you normally watch TV in the house, that will be a sound your cat is used to. Or, if you typically listen to a lot of music, playing that can provide a distraction for your cat. The key here is not to play the music too loudly. Cats take many cues from their owners, so by speaking to them in a soothing voice and using calm body language, you can help keep them calm. However, as cats are often quite agitated by the flashing lights and sounds, it’s best not to pick them up – they may scratch or bite out of defense. If you’re particularly concerned about your cat during the holidays, make sure to talk to your local cat veterinarian about possible solutions. There are a variety of anti-anxiety medications that can be prescribed, as well as some pheromone treatments that reduce anxiety (Feliway is a commercially available products that many cats respond well to).